This is a list of the tallest buildings in the world that are wholly used as hotels. Some tall buildings are multi-use and have a hotel occupying the building's uppermost floors. Such hotels are known as the highest hotels in the world. The world's highest hotel is The Ritz-Carlton in Hong Kong. This list ranks both completed as well as topped out hotel buildings that stand at least 150 m (492 ft) tall, based on standard height measurement. China 165 metres (541 ft) 45 ? 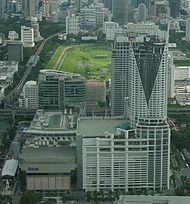 This list contains hotels skyscrapers that are at least 150 m (490 ft) in height and are currently under construction. A. ^ Construction is on hold since 2011. ^ "The World's Highest Hotels". Telegraph. Telegraph. Retrieved 17 April 2016. ^ "Gevora Hotel Dubai". The National. The National Newspaper. Retrieved 13 February 2018. ^ "JW Marriott Marquis Dubai". The Skyscraper Center. Council on Tall Buildings and Urban Habitat. Retrieved 27 March 2013. ^ "Four Seasons Place". The Skyscraper Center. Council on Tall Buildings and Urban Habitat. Retrieved 10 October 2017. ^ "Rose Rayhaan by Rotana". The Skyscraper Center. Council on Tall Buildings and Urban Habitat. Retrieved 27 March 2013. ^ "Burj Al Arab Hotel". The Skyscraper Center. Council on Tall Buildings and Urban Habitat. Archived from the original on 10 December 2012. Retrieved 27 March 2013. ^ "Jumeirah Emirates Towers Hotel". The Skyscraper Center. Council on Tall Buildings and Urban Habitat. Retrieved 27 March 2013. ^ "Baiyoke Tower II". The Skyscraper Center. Council on Tall Buildings and Urban Habitat. Retrieved 27 March 2013. ^ "Wuxi Maoye City - Marriott Hotel". The Skyscraper Center. Council on Tall Buildings and Urban Habitat. Retrieved 27 March 2013. ^ "Khalid Al Attar Tower 2". The Skyscraper Center. Council on Tall Buildings and Urban Habitat. Archived from the original on 25 July 2013. Retrieved 27 March 2013. ^ "Trump Ocean Club Panama". The Skyscraper Center. Council on Tall Buildings and Urban Habitat. Retrieved 14 September 2014. ^ "The Cullinan South Tower". Emporis GmbH. Retrieved 27 March 2013. ^ "Four Seasons Hotel Manama". The Skyscraper Center. Council on Tall Buildings and Urban Habitat. Retrieved 27 March 2013. ^ "Radisson Royal Dubai". Emporis GmbH. Retrieved 27 March 2013. ^ "Grand Lisboa". Emporis GmbH. Retrieved 27 March 2013. ^ "Lanko·Grand Hyatt Hotel". Emporis GmbH. Retrieved 27 March 2013. ^ a b "Ciputra World Hotel Tower". The Skyscraper Center. Council on Tall Buildings and Urban Habitat. Retrieved 27 March 2013. ^ "Centara Grand". The Skyscraper Center. Retrieved 5 October 2014. ^ "Courtyard & Residence Inn Manhattan/Central Park, New York City". SkyscraperPage.com. Retrieved 5 October 2014. ^ "Oasis Skyway Garden Hotel". Council on Tall Buildings and Urban Habitat. Retrieved 27 March 2013. ^ "Swissôtel The Stamford". The Skyscraper Center. Council on Tall Buildings and Urban Habitat. Retrieved 27 March 2013. ^ "Renaissance Center". Emporis GmbH. Retrieved 27 March 2013. ^ "InterContinental Doha The City". Emporis GmbH. Retrieved 29 April 2018. ^ "Angsana Hotel Tower". Emporis GmbH. Retrieved 27 March 2013. ^ "Westin Peachtree Plaza Hotel". Emporis GmbH. Retrieved 27 March 2013. ^ "Ritz-Carlton Jakarta Tower I". Emporis GmbH. Retrieved 27 March 2013. ^ "Ritz-Carlton Jakarta Tower II". Emporis GmbH. Retrieved 27 March 2013. ^ "Four Seasons Hotel New York". The Skyscraper Center. Council on Tall Buildings and Urban Habitat. Retrieved 27 March 2013. ^ "Tamani Hotel Marina". Emporis GmbH. Retrieved 27 March 2013. ^ "Sofitel Jin Jiang Oriental Pudong Hotel". Emporis GmbH. Retrieved 27 March 2013. ^ "Four Seasons Hotel Hong Kong". The Skyscraper Center. Council on Tall Buildings and Urban Habitat. Retrieved 27 March 2013. ^ "Shangri-La Hotel (Dubai)". Emporis GmbH. Retrieved 27 March 2013. ^ "Hotel Ukraina". The Skyscraper Center. Council on Tall Buildings and Urban Habitat. Retrieved 27 March 2013. ^ "Encore Las Vegas". The Skyscraper Center. Council on Tall Buildings and Urban Habitat. Retrieved 19 March 2019. ^ "The Address Dubai Mall". Emporis GmbH. Retrieved 27 March 2013. ^ "The Waldorf-Astoria Hotel". Emporis GmbH. Retrieved 27 March 2013. ^ "Wynn Las Vegas". The Skyscraper Center. Council on Tall Buildings and Urban Habitat. Retrieved 27 March 2013. ^ "Gran Hotel Bali". The Skyscraper Center. Council on Tall Buildings and Urban Habitat. Retrieved 27 March 2013. ^ "Millennium Hilton Hotel". The Skyscraper Center. Council on Tall Buildings and Urban Habitat. Retrieved 27 March 2013. ^ "W Times Square". The Skyscraper Center. Council on Tall Buildings and Urban Habitat. Retrieved 27 March 2013. ^ "Hilton Hotel". The Skyscraper Center. Council on Tall Buildings and Urban Habitat. Retrieved 27 March 2013. ^ "New York Marriott Marquis". Emporis GmbH. Retrieved 27 March 2013. ^ "Lotte Hotel Busan". The Skyscraper Center. Council on Tall Buildings and Urban Habitat. Retrieved 27 March 2013. ^ "The New York Palace Hotel". The Skyscraper Center. Council on Tall Buildings and Urban Habitat. Retrieved 27 March 2013. ^ "Langham Place Hotel". The Skyscraper Center. Council on Tall Buildings and Urban Habitat. Retrieved 27 March 2013. ^ "Atlanta Marriott Marquis". The Skyscraper Center. Council on Tall Buildings and Urban Habitat. Retrieved 27 March 2013. ^ "Marriott Rivercenter". Emporis GmbH. Retrieved 27 March 2013. ^ "Swissôtel Krasnye Holmy Moscow". The Skyscraper Center. Council on Tall Buildings and Urban Habitat. Retrieved 27 March 2013. ^ "New York-New York". The Skyscraper Center. Council on Tall Buildings and Urban Habitat. Retrieved 27 March 2013. ^ "Bellagio Resort & Casino". The Skyscraper Center. Council on Tall Buildings and Urban Habitat. Retrieved 27 March 2013. ^ "Dusit Dubai". The Skyscraper Center. Council on Tall Buildings and Urban Habitat. Retrieved 27 March 2013. ^ "The Fairmont Dubai". The Skyscraper Center. Council on Tall Buildings and Urban Habitat. Retrieved 27 March 2013. ^ "Sheraton New York". The Skyscraper Center. Council on Tall Buildings and Urban Habitat. Retrieved 27 March 2013. ^ "The St. Regis Mexico City". Skyscraperpage.com. Retrieved 27 March 2013. ^ "Manchester Grand Hyatt Hotel". Emporis GmbH. Retrieved 27 March 2013. ^ "The Peninsula Bangkok". The Skyscraper Center. Council on Tall Buildings and Urban Habitat. Retrieved 27 March 2013. ^ "Hilton San Francisco & Towers". Council on Tall Buildings and Urban Habitat. Retrieved 27 March 2013. ^ "North Korea's vast Ryugyong Hotel not opening yet after all". CNN. Retrieved 1 May 2014. ^ "The Shangri‑La Hotel, Jeddah". The Skyscraper Center. Council on Tall Buildings and Urban Habitat. Retrieved 27 March 2013. ^ "Central Market Hotel Tower". The Skyscraper Center. Council on Tall Buildings and Urban Habitat. Retrieved 27 March 2013. ^ "VietinBank Business Center Hotel Tower". The Skyscraper Center. Council on Tall Buildings and Urban Habitat. Retrieved 27 March 2013. ^ "Yuanda Central Plaza - St. Regis Hotel". The Skyscraper Center. Council on Tall Buildings and Urban Habitat. Retrieved 27 March 2013. ^ "Western International Finance Center Conrad Hotel". The Skyscraper Center. Council on Tall Buildings and Urban Habitat. Retrieved 27 March 2013. ^ "World Trade Center Hotel". The Skyscraper Center. Council on Tall Buildings and Urban Habitat. Retrieved 27 March 2013. ^ "Financial Street Westin Hotel". The Skyscraper Center. Council on Tall Buildings and Urban Habitat. Retrieved 27 March 2013. ^ "Kula Belgrade". Belgrade Waterfront website. Archived from the original on 6 July 2014. Retrieved 12 January 2017. ^ "Furama Hotel Phase 3". The Skyscraper Center. Council on Tall Buildings and Urban Habitat. Retrieved 27 March 2013. ^ "JJeju Dream Hotel Tower". The Skyscraper Center. Council on Tall Buildings and Urban Habitat. Retrieved 27 March 2013. ^ "Liqin Hotel". The Skyscraper Center. Council on Tall Buildings and Urban Habitat. Retrieved 27 March 2013. ^ "Hilton Hotel Main Building". The Skyscraper Center. Council on Tall Buildings and Urban Habitat. Retrieved 27 March 2013. ^ "Rongsheng Plaza Hotel Tower". The Skyscraper Center. Council on Tall Buildings and Urban Habitat. Retrieved 27 March 2013. ^ "Dicara Gold Tower - Hilton Hotel". The Skyscraper Center. Council on Tall Buildings and Urban Habitat. Retrieved 27 March 2013. ^ "City Center Hotel". The Skyscraper Center. Council on Tall Buildings and Urban Habitat. Retrieved 27 March 2013. ^ a b c d e f "The Centaurus Hotel". skyscrapernews.com. Retrieved 27 March 2013.